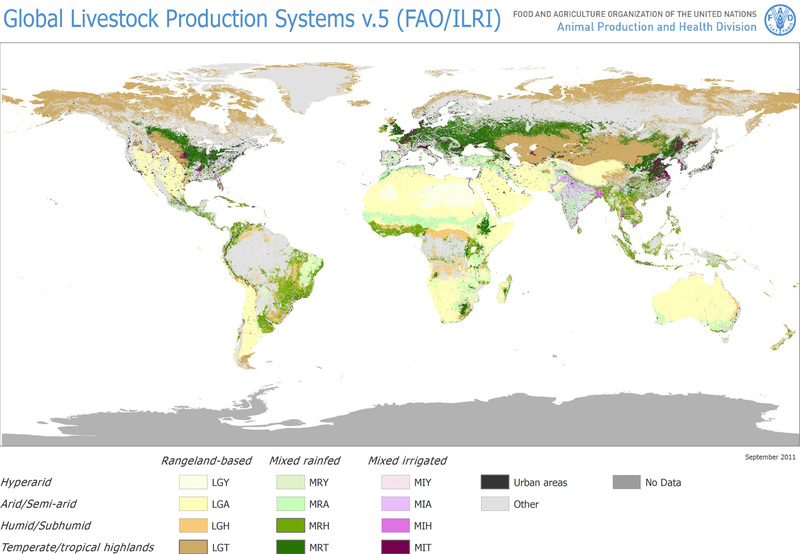 The dataset "Global Livestock Production Systems in Rangelands" presents a subset of data from the Map of Global Livestock Production Systems (version 5), a joint initiative between FAO and ILRI. It contains country-level indicators that measure the extension (in sq. km) of livestock-sistem only in rangeland-based areas, disaggregated by hyperarid (LGY) and arid/semi-arid (LGA) zones. The full reference for the Map of Global Livestock Production Systems (version 5) is: Robinson TP, Thornton PK, Franceschini G, Kruska RL, Chiozza F, et al., (2011): Global livestock production systems. Rome: Food and Agriculture Organization of the United Nations (FAO) and International Livestock Research Institute (ILRI). pp. 152. http://www.fao.org/docrep/014/i2414e/i2414e.pdf. Further Information on the Map of Global Livestock Production Systems is available here: http://www.fao.org/ag/againfo/resources/en/glw/GLW_prod-sys.html. Robinson, T.P., Wint, G.R.W., Conchedda, G., Van Boeckel, T.P., Ercoli, V., Palamara, E., Cinardi, G., D’Aietti, L., Hay, S.I and Gilbert, M. (2014) Mapping the global distribution of livestock. PLoS ONE 9(5): e96084. doi:10.1371/journal.pone.0096084.